Sometimes I’m on the road more often than I’m home. It’s not a complaint; I want to live every day to the fullest and experience as much as humanly possible. I want to be used up when I die, exhausted from a life so well lived that I couldn’t possible be disappointed. It can be tiring fulfilling my bucket list adventures though and serene, picturesque resorts start calling my name. I sought out the pure bliss of Carter Estate Winery and Resort this weekend. 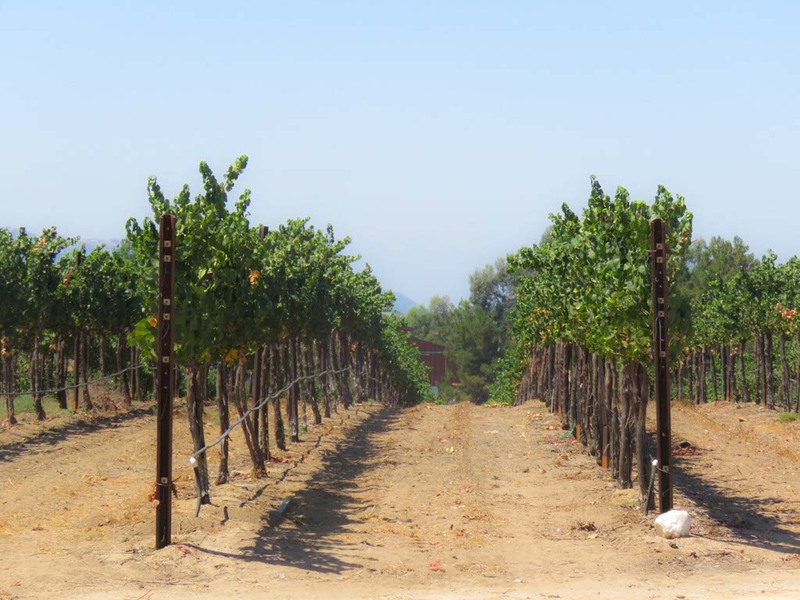 Every aspect of the winery and resort exceeded my expectations for relaxation and tranquility. 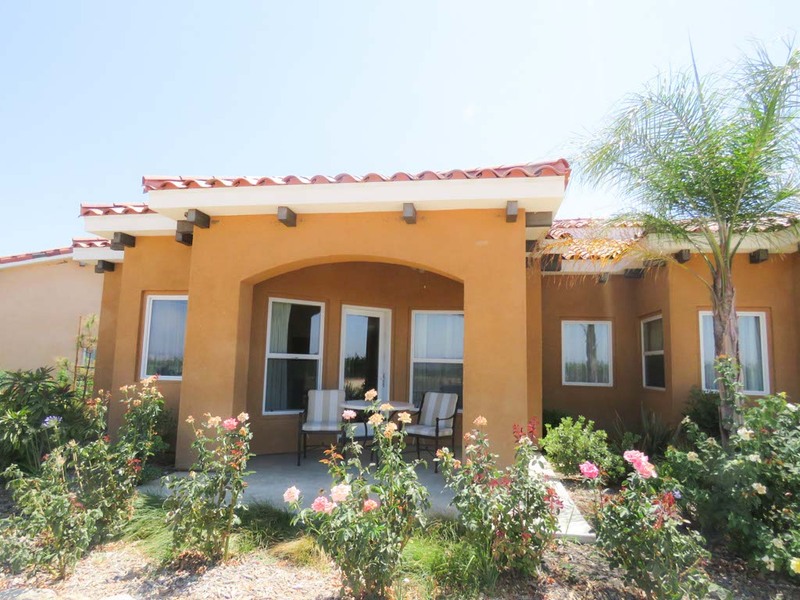 The charm and splendor of Temecula abounds at Carter Estate Winery and Resort. I arrived to a luxurious, Mediterranean-inspired bungalow suite surrounded by vineyards that have produced award-winning wines. 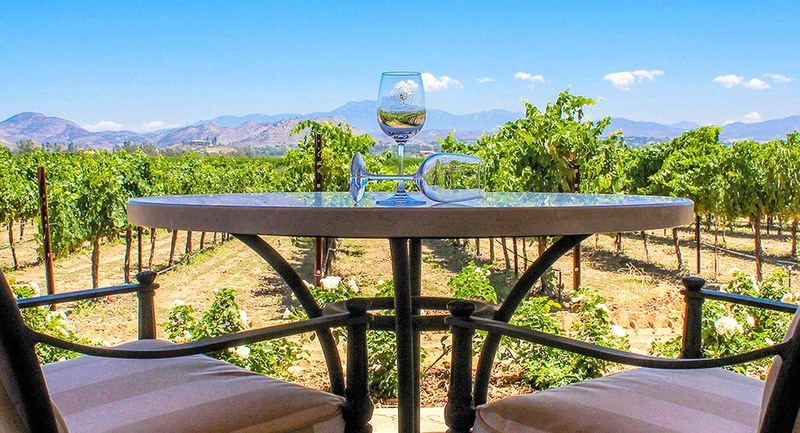 My private balcony area allowed me to soak up the California sun while sipping many of the delicious wines made onsite. 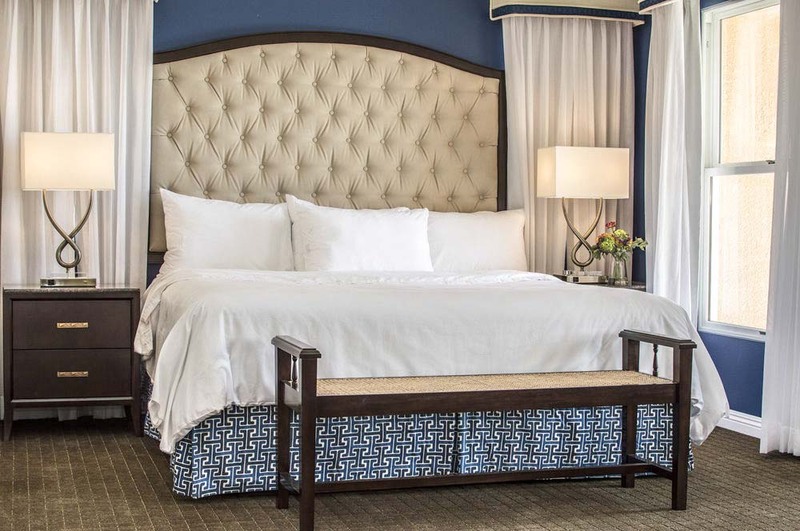 Inside, the king-sized bed was draped in plush down comforters, custom duvets and cotton-rich linens. I didn’t need the electric fireplace but it added to the charm of the suite. I laid in the over-sized soaking tub until my figures were like shriveled grapes already fallen off the vine. The bath salts and luxurious robe completed the soothing experience. In the morning, my patio was transformed into my own, private dining area. 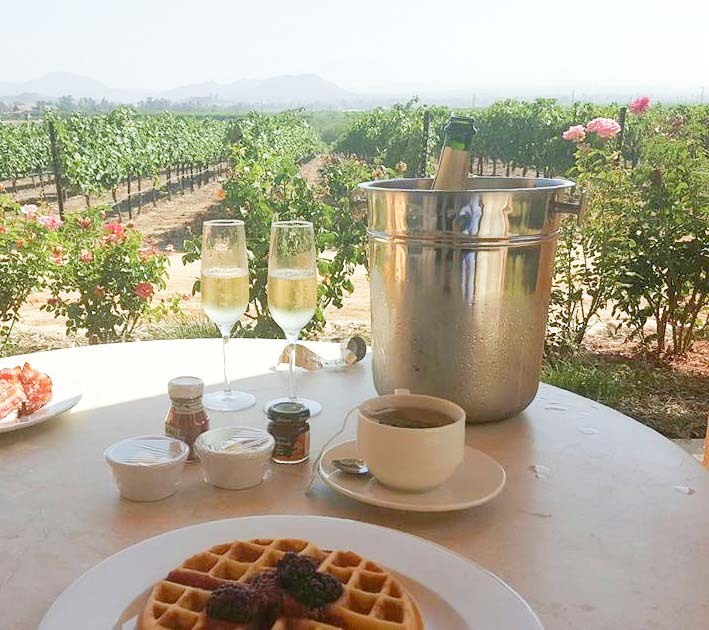 I enjoyed fresh waffles, fruit, bacon, and some bubbly in the comfort of my robe while looking out over the vineyard. A Food & Wine Pairing in the Tasting Room filled my afternoon. I enjoyed five specifically-selected Carter Estate wines paired perfectly with a variety of cured meats, artisan cheese and accompanied with seasonal accoutrements. Normally, the pairing lasts approximately 90 minutes but we all hit it off so well that we ordered additional bottles of wine and stayed for hours into the late afternoon. I met another seasoned traveler and we shared stories of adventure and culture. She was a beautiful reminder of what I love about travel and new experiences. I left in awe of the possibilities. 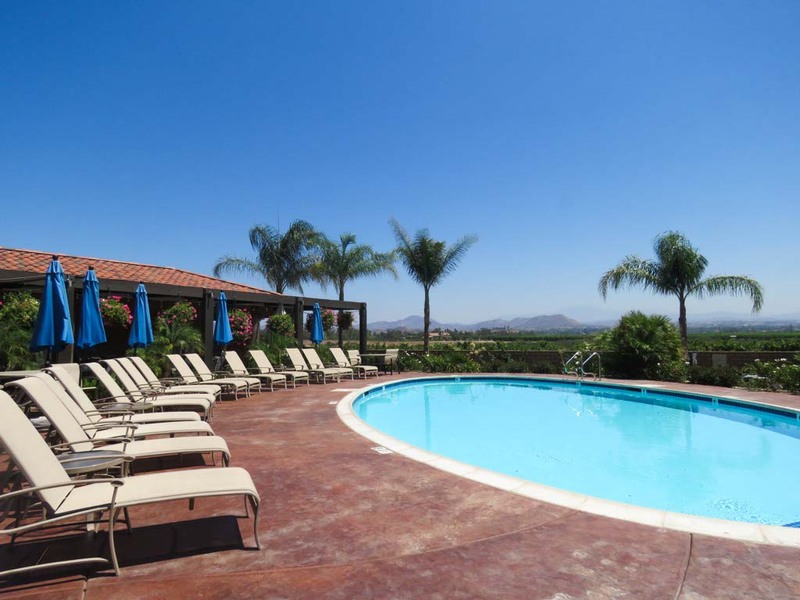 My trip wouldn’t be complete without a dip in the heated pool or a rest on one of the lounge chairs. Of course, I needed a glass of wine in my hand, but after wine tasting, followed by wine drinking, I was already feeling a little tipsy. Luckily, there was no to drive or leave the resort. In-room dining options are available for dinner as well, and Carter Estate believes in freshness as the key to high-quality cuisine. They use the term “field-to-fork” to describe their menu selections. I’d suggest tasting the All Natural Filet Mignon paired with Carter Estate Cabernet Sauvignon. If I ever have a “Last Supper” option, this is what I’m going to choose. The resort can be an endless Abyss for relaxing pleasure. It became like the Bermuda Triangle; once I set foot on the property, I never left until it was time to check out on Sunday. 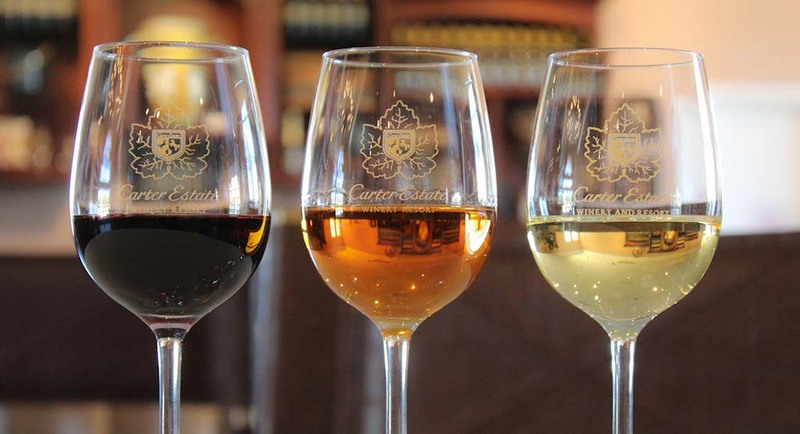 If you’re looking for an escape from every day life or just a place to enjoy the finer things in life like wine travel, Carter Estate Winery and Resort is like stepping into another world. Wow! I love the bedroom. And the vineyards looks beautiful!